The event started with a basket of breadsticks. There wasn't anything new about the bread. They were the same Olive Garden breadsticks that people seem to either love or hate. The first new item was the Polenta Shrimp alla Greca. This consisted of shrimp over polenta topped with olives, capers, and tomato sauce. Spicy Calabrian Wings came next. These wings were served with a gorgonzola dipping sauce and a freshly made spicy sauce made from chili paste and oil. The wings were slightly spicy, but still weren't overpowered by the flavoring. Two new salads came next. Both of these salads seemed like the same base salads that Olive Garden always served, only covered in toppings. The first was the Antipasti Italian Meats & Cheeses. The salad was topped with sliced salami, pepperoni, and mozzarella. For some reason this salad was very poorly tossed with certain bites soaked in dressing, while other bites were completely dry. The other new salad was the Roasted Tomato Caprese. This one was topped with roasted tomatoes, kale, and balls of fresh mozzarella. I preferred this salad out of the two, with the exception of the kale. There was far too many chewy kale stems and not enough of the parts of the leaves that were a bit more tender. The Smashed Chicken Meatball Sandwich was described on the menu as: Focaccia bun with roasted bell peppers and mozzarella. Served in a spicy diavolo tomato sauce. With parmesan garlic fries. The next two dishes were part of Olive Garden's Cucina Mia section of the menu where you get to pick your own pasta and toppings. Based on what we were served, I'd avoid this section of Olive Garden's menu. The Large Paccheri with Creamy Sun-Dried Tomato lacked any hint of sun-dried tomato. The paccheri noodles were either way undercooked or were sitting out way too long. Pasta shouldn't be bent and then hold whatever position you bend it into. The meatballs were the same that was used in the smashed chicken meatball sandwich, but here they were forgettable without the flavors that the sandwich's sauces provided. The second Cucina Mia dish was the Vegetable Penne Primavera. The penne was topped with marinara with zucchini, red peppers, onions, and tomatoes. Those vegetables must have been chopped up really finely in the sauce, because all I detected was tomatoes. This was a pasta dish like something I would cook at home when I'm feeling lazy. Make some pasta and pour a jar of tomato sauce over the top. Chicken Abruzzi consisted of grilled chicken, cannellini beans, kale, and other vegetables in a broth. Out of everything served, this was one of my favorite dishes. The chicken itself was a bit dry, but I liked everything else here. The broth was nice and flavorful. The beans were hearty and the vegetables were nice and tender. Pappardelle Pescatore was another disappointing pasta dish. This contained sautéed shrimp, bay scallops and clams tossed with pappardelle pasta, fresh asparagus and tomatoes in a creamy, red pepper seafood sauce. I did enjoy the red pepper sauce. It was spicy and really flavorful. As for the rest of the dish, it contained two shrimp, two chewy clams, and one tiny scallop. The fresh asparagus only consisted of the lower stems and none of the tender asparagus heads. I'd be unhappy with this dish if I ordered it, especially when compared to how it appears on Olive Garden's menu. The Chicken Primavera with Giant Fusilli was my favorite of all the pasta dishes. Two pieces of chicken breasts were served over the pasta. There were lots of vegetables mixed in with the slightly spicy sauce. This is what a primavera pasta should look like, unlike the Cucina Mia version of the Vegetable Penne Primavera seen above. For dessert, we sampled the Wild Berry Layer Cake. I enjoyed all of the tart berries that topped the cake. Overall, I don't think Olive Garden's new menu is going to change anyone's mind about the restaurant. If you were already a fan of the restaurant, you'll probably still like them. If you weren't, the new menu items probably aren't going to win you over. I had lunch at LA Boiling Crab in the Mills-50 District of Orlando. 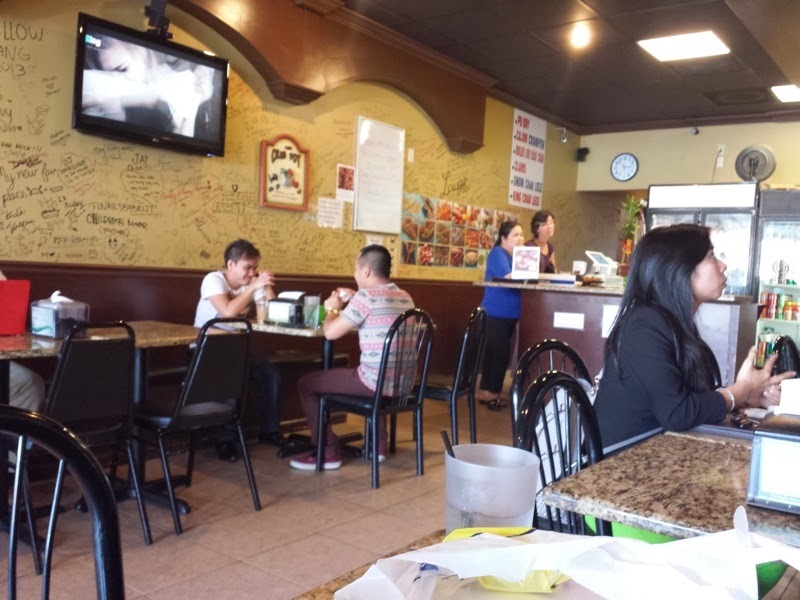 Surrounded by Vietnamese and Chinese restaurants, this place specialized in New Orleans style po boy sandwiches, crawfish, crabs, and other types of seafood. I ordered the soft shell crab po boy. 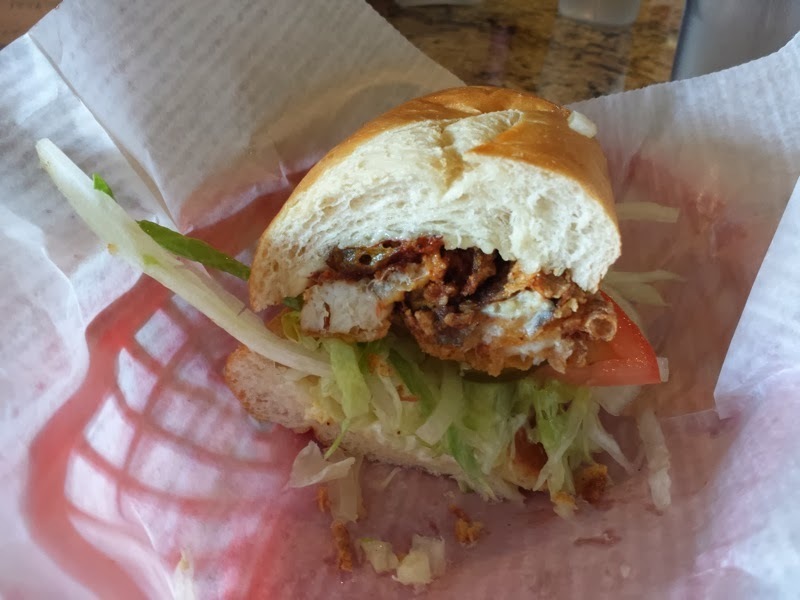 This sandwich was filled with fried soft shell crab, lettuce, tomato, onion, and mayonnaise. It was served on a French baguette with a nice, crispy crust. The crab was very tender and the batter that it was fried in had plenty of flavor. I shared an order of beignets for dessert. 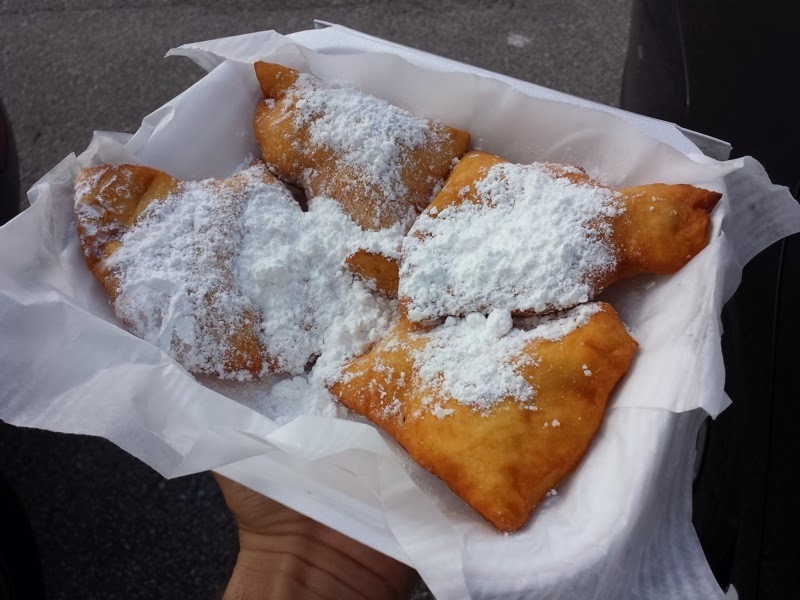 These four fried fritters were topped with plenty of powdered sugar. They were light and airy on the inside. They may be a type of doughnut, but beignets aren't just any doughnut. Beignets are the official state doughnut of Louisiana! An appropriate end to a meal at a restaurant with LA in the name. I had fun at LA Boiling Crab. 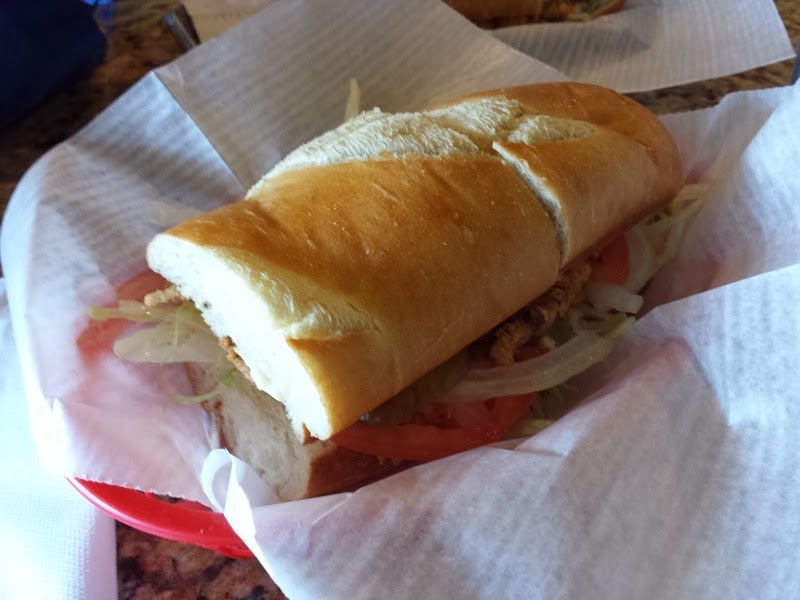 It had been a while since I've eaten Cajun food, so having a po boy and beignets was enjoyable. At some point I want to return here and try some of their crawfish and crabs which smelled delicious as I was eating.